"Dread of what?" Carl Jung wrote in his memoirs. Reflecting upon his youth, and his fellow students' incapacity to "admit unconventional possibilities," Jung continued, "After all, there was nothing preposterous or world-shaking in the idea that there might be events which overstepped the limited categories of space, time, and causality. Animals were known to sense beforehand storms and earthquakes. There were dreams which foresaw the death of certain persons, clocks which stopped at the moment of death, glasses which shattered at the critical moment. All these things had been taken for granted in the world of my childhood. And now I was apparently the only person who had ever heard of them. In all earnestness I asked myself what kind of world I had stumbled into. Plainly the urban world knew nothing about the country world, the real world of mountains, woods, and rivers, of animals and 'God's thoughts' (plants and crystals). I found this explanation comforting. At all events, it bolstered my self-esteem, for I realized that for all its wealth of learning the urban world was mentally rather limited." But if the city represented cold, hard, narrow realism to rural mystics, a scientific rationalism which was blind to the stream of rich unconsciousness imbuing everything, it could also be invested with a kind of alchemical magick, a dream-projection of civilization taking the same subversive approach to the functional architecture of the metropolis that urban minds took towards the natural wonders of the countryside. The utilitarian skyline could be transformed into an oneiric dreamscape, a mental correspondence to the byzantine mazes of the imagination. 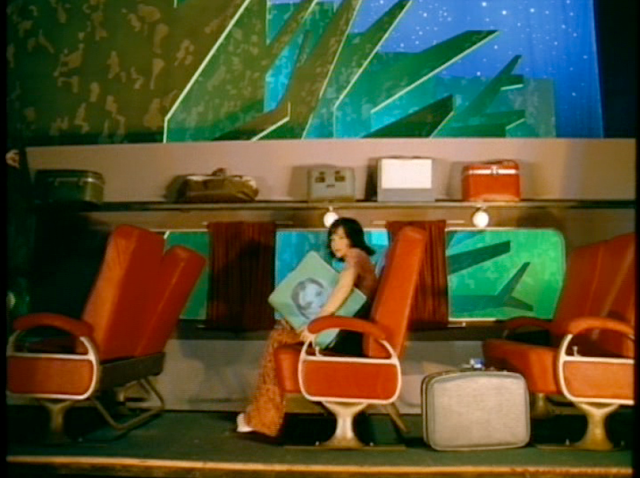 This post, using images from Zhang Ke Jia's film The World (reviewed last week) and Michel Gondry's music videos alongside quotations and my own thoughts, will offer a brief reflection upon this perennial theme. Elsewhere in his writing, Jung recalls a vivid dream in which Liverpool appeared to him. "I found myself in a dirty, sooty city. It was night, and winter, and dark, and raining. ... I had the feeling that we were coming up from the harbour, and that the real city was actually up above, on the cliffs. We climbed up there. When we reached the plateau, we found a broad square, dimly illuminated by street lights, into which many streets converged. The various quarters of the city were arranged radially around the square. In the centre was a round pool, and in the middle of it a small island. While everything round about was obscured by rain, fog, smoke and dimly-lit darkness, the little island blazed with sunlight. On it stood a single tree- a Magnolia- in a shower of reddish blossoms. It was as though the tree stood in the sunlight and was at the same time the source of the light. My companions commented on the abominable weather, and obviously did not see the tree. They spoke of another Swiss who was living in Liverpool and expressed surprise that he should have settled here. I was carried away by the beauty of the flowering tree and the sunlit island, and thought 'I know very well why he has settled here'. Then I awoke." Tellingly, Jung had never visited Liverpool - "the pool of life" - before this dream. These urban dreamscapes, these cities of the imagination, have less to do with actual cities than with dreams about cities. Such city-dreams are the province of visionaries, and perhaps we are all visionaries in sleep - or in childhood. As a boy growing up in a small seaside town, I would look out my bedroom window at treetops in the distance, convincing myself that I could see the skyline of New York on the horizon (I had lived there before I turned three, a time shrouded in the mists of subconscious memory). Later, after moving to New York, I was struck with a series of vivid, almost hallucinatory "city dreams." From these, birthed in the wake of 9/11, I recall fluid cityscapes: in one, skyscrapers rose and descended through the air like giant Tetris pieces against a yawning apocalyptic sky. In another, twin skyscrapers grew in the backyard of my childhood home in New England; other dreams found me wandering streets beyond the bounds of geographic location. In these dreams, city, village, country mutated and bled into one another - clearly delineated, they nonetheless existed in close proximity, so that I could pass quickly between completely divergent worlds. I remember in one particular dream, a trek across a bridge, passing from a dense but eerily empty city into an ancient Old World village - here there were plenty of people, though I remained somewhat removed from them. Such a consciousness, the universal encapsulated in a close space, once-identifiable areas containing impenetrable multitudes - a microcosm inside a wilderness, or a wilderness inside a microcosm - is summoned forth in the remarkable Chinese film The World. The World also deals with the conflict between dream cities of the imagination and the harsh realities of city life. Here we have a theme park, a kind of physical incarnation of modern China's self-conscious entry into the globalized world. International monuments - the pyramids, the Eiffel Tower, the New York skyline (Twin Towers still standing) - are reproduced on a smaller scale, joined together by a monorail in a safe little mini-world. Yet the staff of this park must also brave the slings and arrows of the real city around them: Beijing, with its displaced populations, dangerous jobs, criminal ensnarements, and romantic betrayals. Jia blurs the boundaries between the city of fantasy and the city of fact by showing us the workaday realities behind the theme park's artificial facade (the real in the imaginary), but also the beauty and poetry of the overwhelming, no-nonsense Beijing (the imaginary in the real). 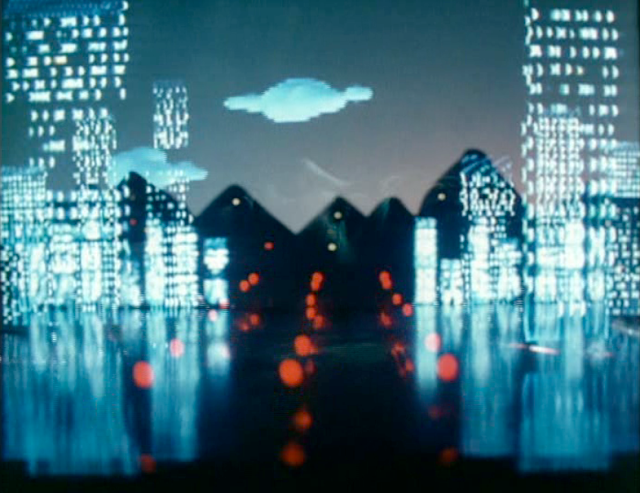 Many of the characters in the film arrive from the provincial Shanxsi region, where Jia's earlier films took place (including Platform, which focuses on the mysterious passage between times rather than between places). Jia himself grew up in Shanxsi, and indeed The World conveys a dreamy outsider's conceptualization of "the city." A disillusioned dreamer to be sure, but one who has not lost his penchant for the mythic, the visionary, the mystical side of the everyday. Here the countryside - the counterpoint to the city in ways obvious and subtle - remains offscreen. The rural world is only revealed near the end, in the sorrowful faces of grieving peasants, come to Beijing to settle their son's affairs after he has died in an industrial accident. In this world, the city - big, terrifying, unwieldy, cacophonous, brutalizing - has won. Yet this urban, technological, cosmopolitan victory paves the way for new experiences, new escapes - fleeting though they may be. In The World, these take the form of vivid, simple, striking animated sequences, fantasies triggered by text messages popping up sporadically on the characters' phones. 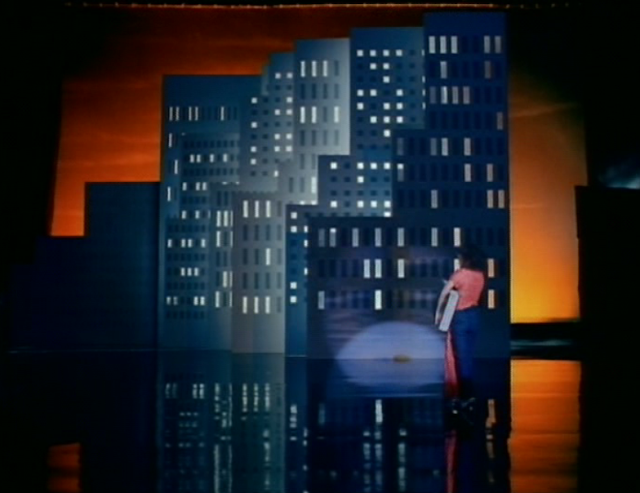 These visuals also provide an appropriate segue into the entirely fantastical, allegorical dream worlds of Michel Gondry, another country boy with divided loyalties, in awe of (and frightened by) the big city. In the video for Bjork's "Bachelorette," a young woman (played by the singer, of course) finds a book in the woods. She takes a train into the city, discovering a sleazy publisher who makes her and her book famous. The story is re-enacted several times, on scratchy black-and-white celluloid, as a lavish stage production, and then through plays within plays, unfolding metatextually like nested Russian dolls. 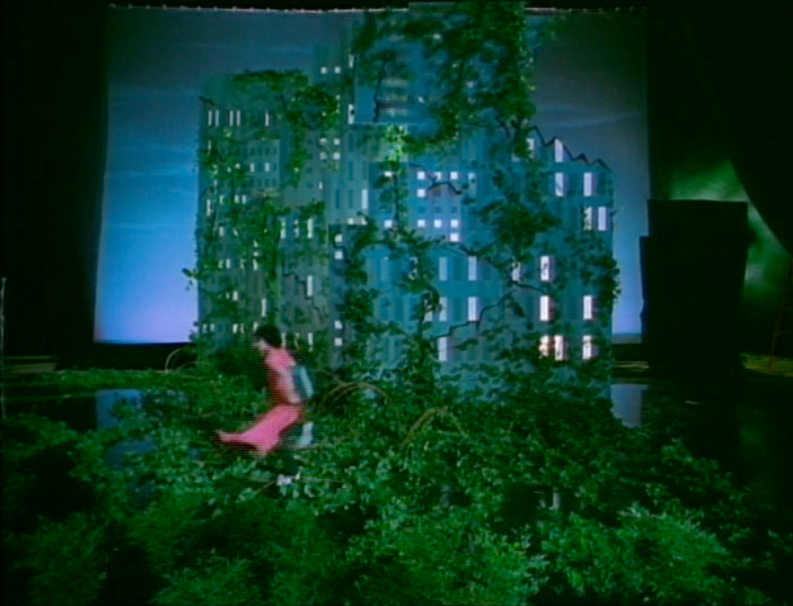 The thematic heart of this whole enterprise rests in the journey from forest to city, demonstrated ingeniously through the various theatrical sets (in one, we peer out Bjork's train window to see green pillars - trees - rotating as the lights and colors change, until they've become cylindrical skyscrapers). The pronounced, ambitious conceits of the video become a bit heady, and truthfully director Michel Gondry has bitten off more than he can chew. Gondry at his strongest takes complex ideas and renders them in deceptively near-childlike terms - or else develops ornate, complicated executions of simple ideas. "Bachelorette" throws together too many different notions and styles, piles on too many gestures, to truly succeed. It devolves into a mess, albeit a fascinating one. Still, it's the baldest and boldest expression of Gondry's sensibility - the tension between the natural world and the manmade, filtered through a brilliant consciousnesses which sees both as expressions of his intensely creative imagination. On the DVD housing Gondry's oeuvre, there is a documentary in which the director unveils a mini-world, self-constructed, divided between forest and city, no gradation or overlap between the two. 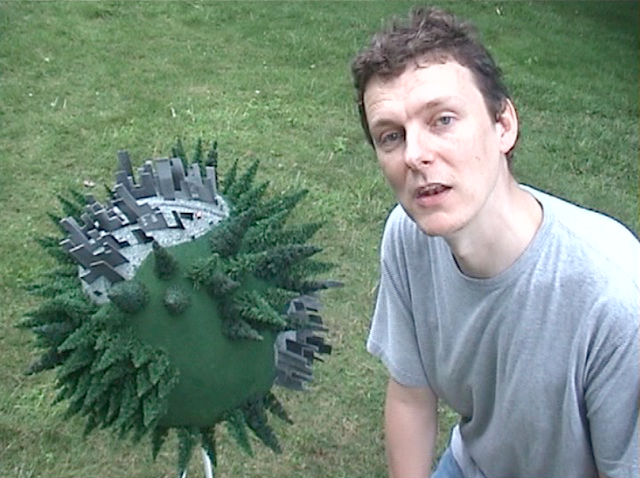 Gondry tells us, "Many of my videos use the contrast with nature and the city. I think it's because when I was younger I was living in a house exactly on the limit of the forest and the city and in my mind I was not sure what was underneath, if it was the concrete of the city that was composing the whole earth of if it was the dirt of the forest." Then he utilizes a chainsaw to cut the globe in half and reveal - of course - that the earth is made up of both dirt and concrete, and is not reducible to one of the two elements. This nature-civilization dualism cannot be resolved so easily. Yet Gondry's fascination with both worlds constantly forces them into close proximity. At the end of "Bachelorette," vines overtake the skyscrapers, city folks turn into trees, and the result is the exact reverse of Jia's conclusion in The World: nature, the old way of life, overcomes and overwhelms the world of man. 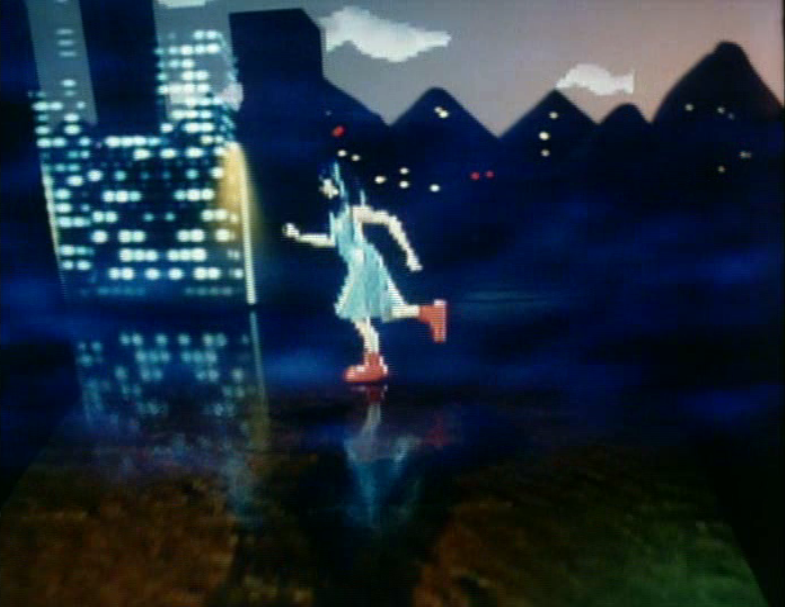 The image of Bjork fleeing the collapsing city easily transitions into a video-game image of the singer in Gondry's "Hyperballad", this time entering a virtual city, where the same repressed violent upheavals will simmer. 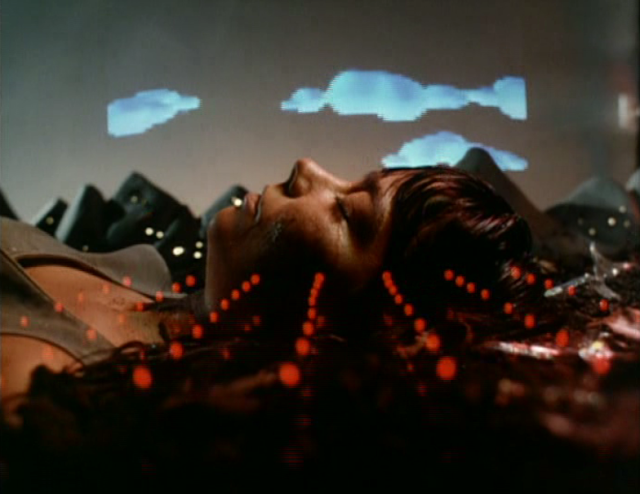 Another Gondry obsession is an almost mathematical repetition with variation - his videos are intensely structural. 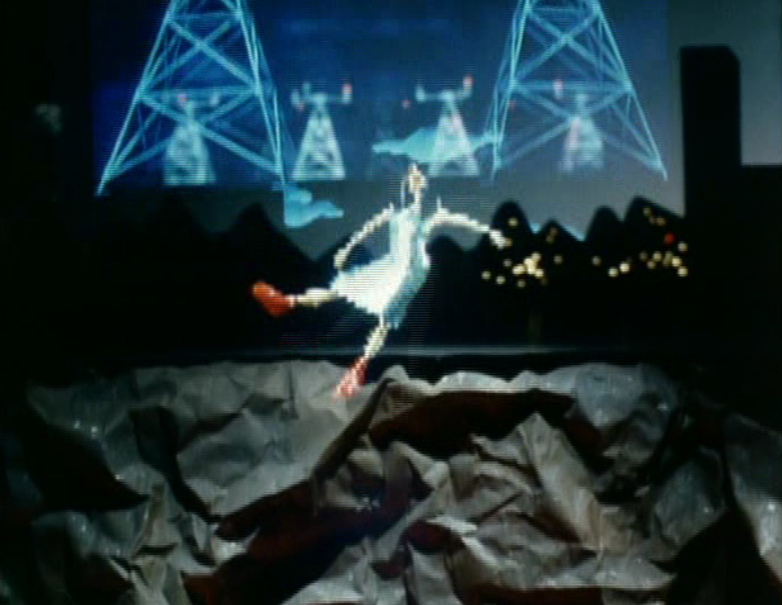 Sometimes thematic and formal obsession are joined - as in the Chemical Brothers' "Star Guitar" which peers out a train window at a passing landscape, natural and industrial landmarks passing by again and again, their reappearances synced to looped techno drumbeats on the soundtrack. 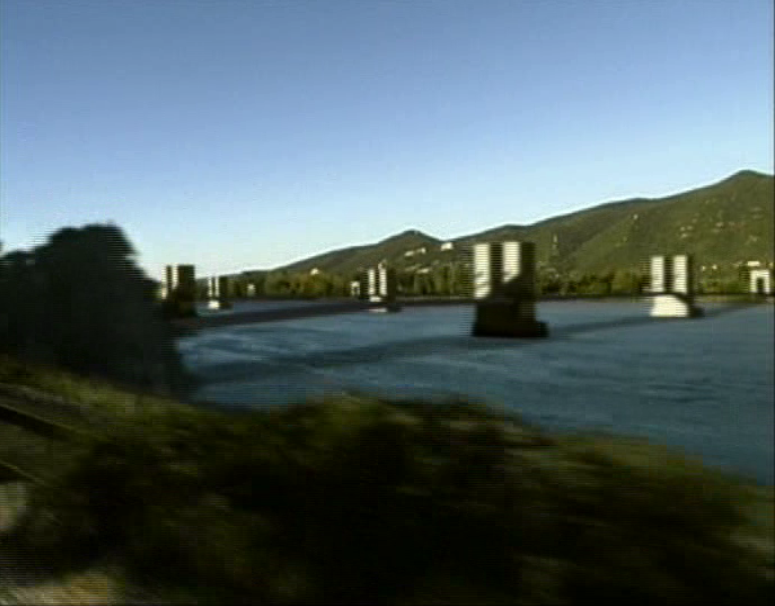 (That previous image of the bridges was culled from this video.) Gondry is at his most brilliant when uniting dreamlike inspiration with incredible technical ability - a fusion of the divergent strands of the left brain and right brain. 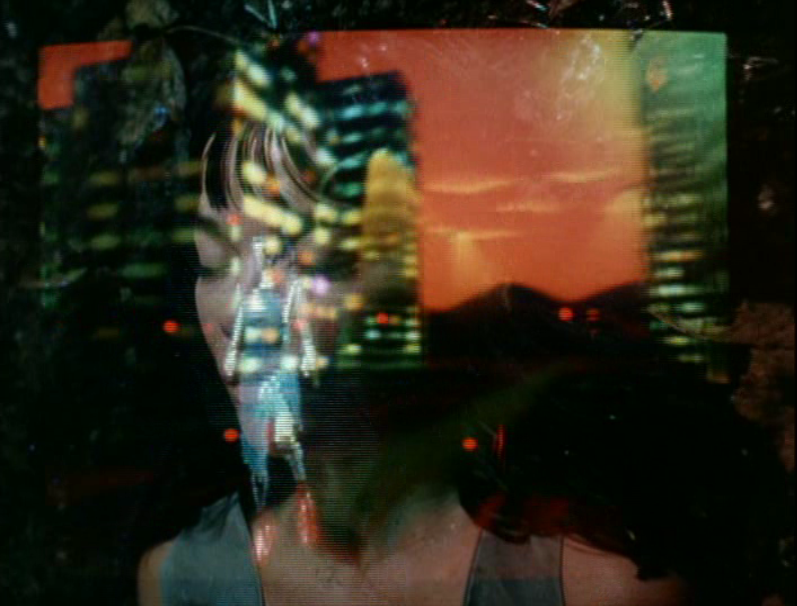 In this sense, like Jung, Gondry belongs both to the mystic country and the rational city; he unites those two strands so starkly opposed onscreen. Openly courting absurdity, "Hyperballad" achieves sublimity because unlike "Bachelorette" it unites its "story" to the rhythmic propulsion of the music. It also keeps its imagery somewhat abstract and oneiric. A viewer could "go with the flow" and perceive a purely dreamlike, irrational experience, yet these visuals are not random. 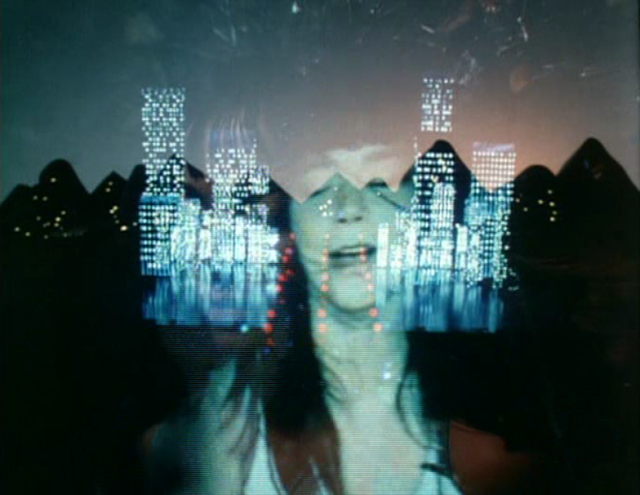 In "Hyperballad" we see three Bjorks - a computer-generated avatar, a dormant frozen figure (looks like a mannequin) around which the camera circles, and a video projection of the "live" Bjork, singing along with the lyrics. Already the notion of different realities, external manifestations of multiple, fluid consciousnesses, is evoked. 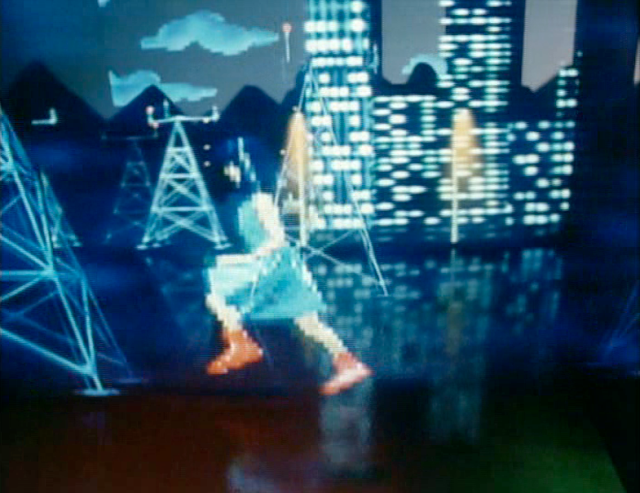 This idea is compounded as the "video-game" Bjork jogs across a flat plane, mountains looming in the background, and enters the city bounds, where she must dodge and weave through tall buildings and radio towers, until she leaps in the air, falls, and then shatters into many pieces. The sequence is repeated from different viewpoints until finally the figure jogs through the whole city and we see the projected "live" Bjork flanked by both the skyline and the mountains - here we finally seem to have the synthesis between all the visual and thematic elements. 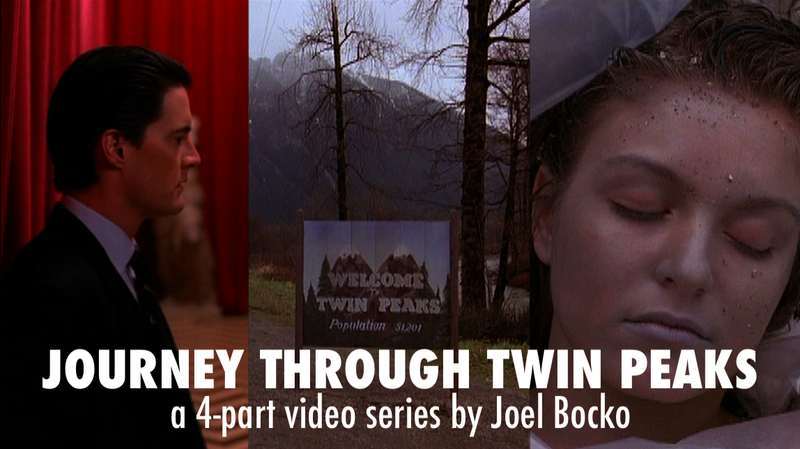 However, in the final moments, both singer and city fade away, leaving only the mountains dotted with mysterious blinking red lights (perhaps they represent flickering outposts of civilization, overwhelmed by the natural world). Though his videos could only be enacted with a hyper-conscious control, in the end Gondry privileges the deep roots of his imagination, identified with nature. At any rate, the director's imaginary cities are also manifestations of this imaginative impulse; like Jung and Jia in their various fashions, Gondry's gaze transforms even functional reality into an oblique world of melancholy magic. 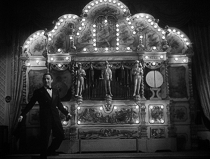 Explanation of the methods, analysis of the meanings can only go so far in conveying this eerie, otherworldly sensibility - "dancing about architecture" in the extreme (though if any figure could unite those two forms, it would be Michel Gondry). 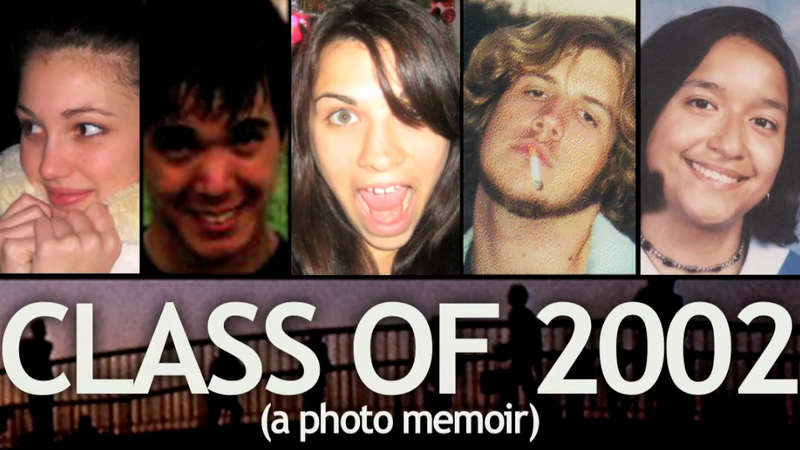 Some, like Jung's classmates, may wonder what the fuss is about. 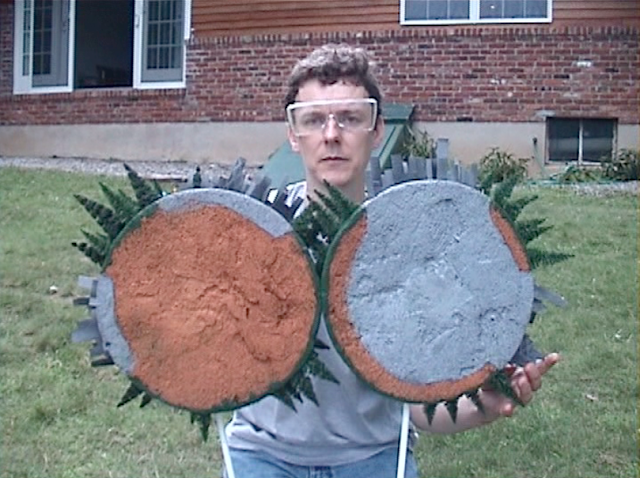 They cannot see the tree in the center of the city (or the cities in the trees). Those of us who can, however, will "know very well" why we've settled here - or at least why we're passing through. Before I moved to Boston, I would have dreams that took place in Boston - but it was Boston as named by my brain, having almost nothing in common with the real thing (save that both cities were by the sea). The Boston of my dreams was partially flooded, like Venice, and many people used small boats to get around the city. There was a monorail system that would only take you to the airport or a huge mall (no stops in between!) and skyscrapers went thousands of feet into the sky. It was always raining - I can remember a specific dream in which my father, sister and I had to get to the airport, but couldn't afford the monorail ticket. We rented a small boat, paddled our way to a dirt enbankment and hoofed it the rest of the way. These dreams were always very vivid; the memories are just as strong as any "real" memory I posess, but much more evocative. The stuff about the recreated-city playground of "The World", not unlike the various recreated-city playgrounds of Las Vegas, reminds me of an incident from "The Aeneid", where Aeneas encounters a settlement of refugees from his homeland of Troy. There, they have grown prosperous, and have constructed a recreation of their lost city of Ilium-- a simulacra-- which fills Aeneas with a nostalgic pang, reminding him of his own divinely ordained quest to seek out a settlement and found a new Troy, which will eventually become Rome. There's a fair amount of propaganda in Virgil's writing (Rome as the successor to a mythical Trojan legacy, in stark opposition to the Greeks and their Homeric standard of epic heroism in poetry), just as there is in the idea of all those colonizing mini-cities representing a new birth of Chinese influence onto the world stage. The dream city is also a platform for political concerns-- or, in a less partisan language, for social ones. It's where we're forced to come into contact, and often conflict, with other people. Meanwhile, less urban landscapes mean less people, and more of an opportunity to be alone. It's easy to see how this becomes a universal language in dreams-- cities represent the conflict we come into with other people, with the social world; forests represent the conflict we come into with ourselves. Both are sites of conflict, though, yet with different scales-- when we imagine a city under attack, whether from real-life forces or imaginary ones, it always arrives in the language of war, betraying a seige mentality not unlike that of Ilium during the Trojan War. Forests, though, are where we find the lairs of monsters and threats that usually can only be countered by lone individuals, instead of the masses. When Godzilla attacks the city, an army arrives to fend him off; when a fire-breathing dragon hides in the woods, a lone knight rides off to face the beast by himself. this is exactly the sort of dream I'm talking about! Cities with their own mad geography. I had these sort of dreams about places I knew too - sometimes it was almost as if I was tapping into the inner life of a place. In the dreams, they were always melancholy and somewhat hostile. "just as there is in the idea of all those colonizing mini-cities representing a new birth of Chinese influence onto the world stage." Great observation - all of Jia's films I've seen so far are about development of China, and all deal with it in slightly ethereal terms, a ground-eye view of a massive phenomenon. The distinction between city and forest is interesting; sometimes, however, I feel like the two overlap and stand in for one another. I'm reminded of an anecdote about Kenneth Grahame - and there should still be a Wind in the Willows post coming up down the line - using the Wild Wood as a metaphor for his own incomprehension facing London. Likewise, sometimes in my city dreams, I find myself wandering empty streets among towering buildings, almost like wandering through a forest with looming trees. Even when there are people in the city-dreams, I find they're usually unreachable, somewhat distant. Incidentally, as these comments point out, there are a million avenues to explore here. 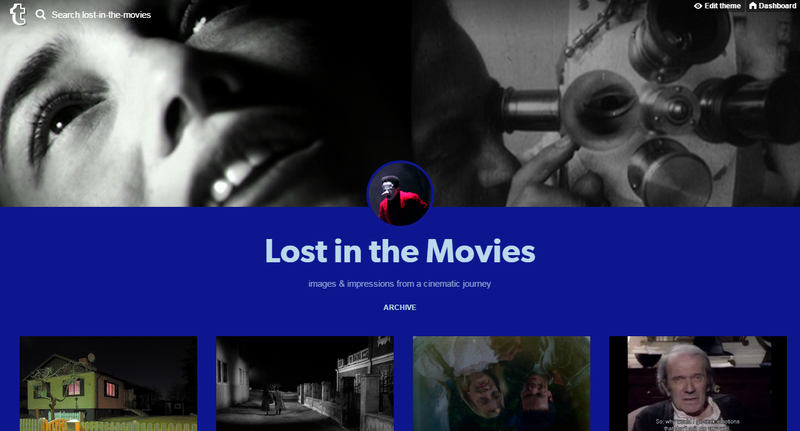 Originally, I had lots of movies in mind but naturally focused on a couple to keep the post from getting out of hand. I had in mind also cities which incorporate many worlds into one - The World is an example here, Babe: Pig in the City would be another. And as far as transitions between the country and the city go, Sunrise is of course the prime example. 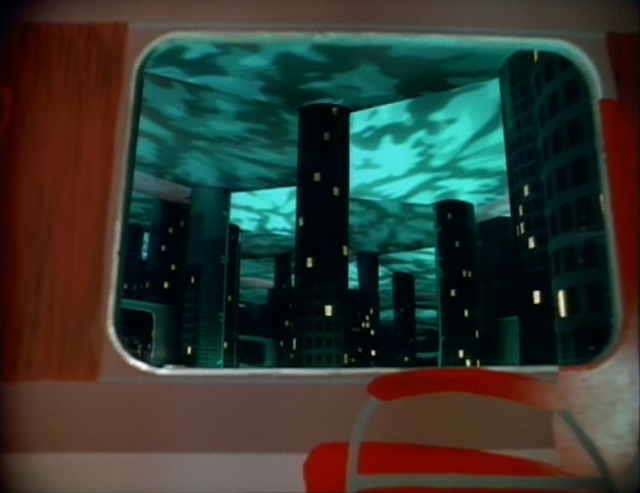 I love that sequence on the tram where they pass almost unknowingly into civilization, very much as if in a dream. Joel, if you read "The Aeneid", make sure to read Homer, first. It would then be an easy next-stop to Dante, eventually, seeing how largely Virgil looms in the Florentine poet's work. Also-- I watched the "Bachelorette" video after reading this review, and immediately thought of Kaufman's "Synecdoche, New York". 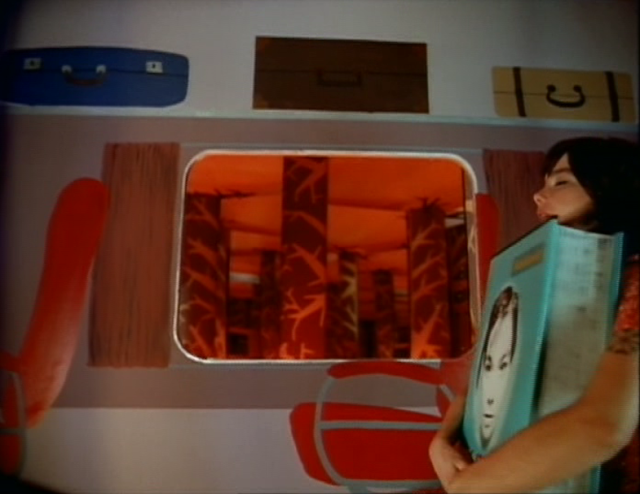 It's really a shame Gondry didn't take a stab at that screenplay, but then again, maybe he figured there wasn't much point-- he'd practically made the film already. I wonder if Kaufman was inspired by the video, come to think of it. 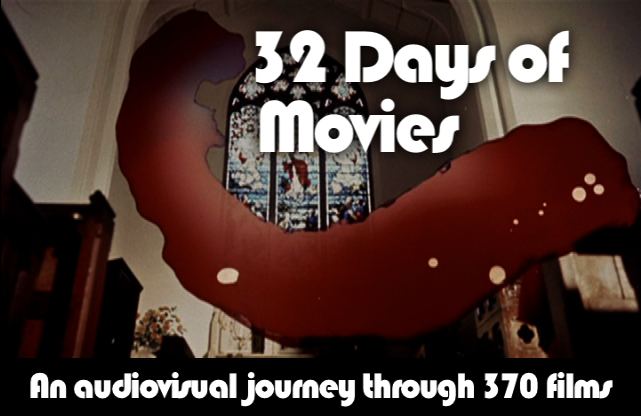 At any rate, both are hindered by a case of turtles-all-the-way-down vertigo, though Gondry takes it in stride much easier-- perhaps that concept of the play-within-a-play-within-a-play ad infinitum can only really sustain a shorter work, rather than a feature. I've read Homer and, ironically given the chronology, Dante (at least the first two books of the Divine Comedy). I think Bachelerotte might have been a less messy video if Gondry has lost some of the ideas (like the film) and just focused on the play-within-a-play concept. The Synecdoche connections is fascinating; oddly enough, it never occurred to me. 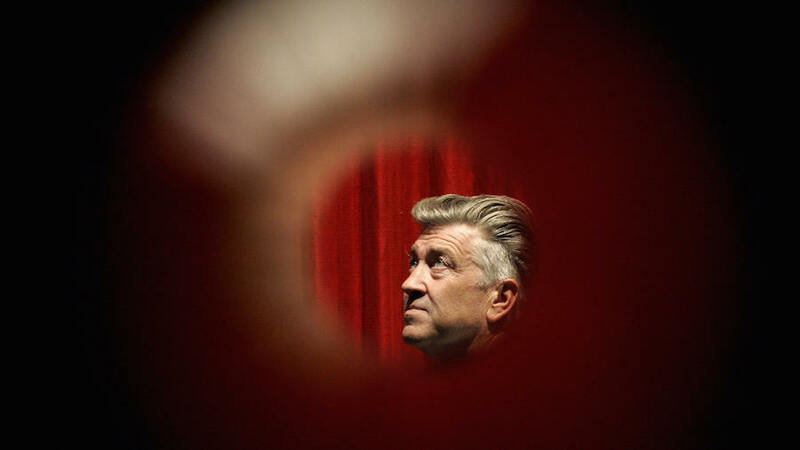 Now I wonder - if so, Kaufman must have originally had Gondry in mind to direct. Btw, I haven't seen Human Nature yet - have you? What did you think? Geez, I just noticed this. I'll need to focus to respond, but I'll try to come back tomorrow. Great comments indeed! Brings up a lot of fascinating ideas culled from my time in the Bay Area: Quantum physics (where so-called matter is both particle and wave), wabi-sabi in Japan where opposites exist not in contrast but in harmony, and stories I have heard about India, where dichotomy is viewed much differently than in Western culture. Thanks, Larale! While I tend to privilege the videos above all else, Eternal Sunshine really was a heaven-sent opportunity for Gondry to explore his themes, visual motifs, and sensibility. Pity that in a way it was overlooked due to Charlie Kaufman's reputation (at the time, probably like many others, I knew more about Kaufman and saw the movie in light of his oeuvre - only afterward, discovering Gondry with the Palm DVD, did I realize how snugly it fit in Gondry's oeuvre as well). I hope Gondry gets more feature opportunities like that in the future - connected to a strong script yet with enough room for his talents to express themselves.